Gardeners have a vital role to play in securing the future of our wildlife by designing gardens to be eco-friendly havens, thinking of the needs of the insects and animals that come into their gardens, and by creating a balance between pests and their natural predators. Natural habitats are shrinking and changing, which is putting increased pressure on our wildlife. With a few simple changes in gardens big and small, we can make a difference and create a network of wildlife refuges across the country. Once you've discovered how to make your garden more wildlife-friendly, head to our dedicated feature on designing a garden from scratch more garden-related advice and ideas. What does wildlife need to flourish? Get the balance right and your garden will flourish, creating a food chain that manages the eco-system of your garden. Keep in mind the benefits of natural pest control: for example, birds and frogs will take care of slugs and snails, and ladybirds love to eat aphids, greenfly and blackfly. Did you know that fewer than one per cent of British insects are garden pests? All the more reason to embrace the mini-beasts. Wildlife-friendly is sometimes thought of as a messy garden, but this doesn’t need to be the case. Attracting an abundance of pollinators will ensure our garden plants and crops continue to flourish. Biodiversity is key to a healthy, wildlife-friendly garden. There is a rich diversity in our gardens, often with more pollinators than in our countryside, but there are lots of simple things we can do to encourage further visitors to our patches and create a green corridor for wildlife. Most gardeners already think about growing a diverse spread of plants encompassing groundcovers, climbers, trees and shrubs, as well as a floral mix of perennials and annuals, so it’s just a case of also considering their use for food and shelter. When selecting plants, spare a thought to including an array that will provide pollen or nectar for bees and other pollinators over as long a season as possible, from early crocus and mahonia to winter-flowering viburnum and ivy. 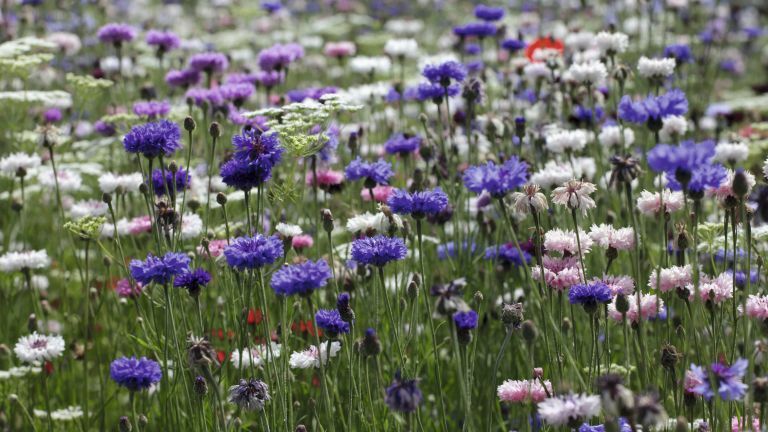 Select open flowers rather than double or highly bred cultivars for the best pollen, and to make easier access for bees, butterflies and other pollinating insects that have the absolutely essential task of fertilisation. Find out more about choosing plants for your garden. Grow a range of both native and introduced species, in mixed hedges, add trees that have both blossom and berries, and look closely at labels such as the RHS Perfect for Pollinators symbol. A note, though – if you are looking for plants for bees and pollinators, they should have been grown without synthetic pesticides. For assurance, it’s worth hunting out an organic nursery and remembering not to spray open flowers. Other easy steps include leaving some seedheads through winter before cutting down the borders completely in early spring, adding a log pile tucked out of sight, providing clean water in a birdbath or shallow dish, keeping a patch of grass long or planting a meadow of wafting flowers mingling with parchment grasses. A patch of nettles is a magnet for beneficial insects, in particular ladybirds for egg laying, and they are considered key to the survival of butterflies as a food source for many caterpillars such as peacock, tortoiseshell and comma. Increasing your garden’s plant diversity and encouraging more wildlife to stop by will make a more interesting and healthy haven for you, too. More insects in your garden will aslo mean more birds; find out how to encourage summer birds back into your garden in our guide. It is estimated that 80 per cent of the Western diet is dependant on bee pollination, so it is important that we do what we can to help the health and survival of our British bees. The prime reason for the waning bee population is the parasitic varroa mite, but we can do our bit by adding pesticide-free nectar and pollen rich flowers. If in doubt about which plants to choose, check out this handy list of bee-friendly plants from Urban Bees. Find out how to create a bee friendly garden. Bees focus their pollen collecting near the hive, returning to the same source until it is depleted, so it is important to plan a succession of choices from early spring to late autumn, and even into winter. Provide long-flowering, single open flowers, old-fashioned cottage plants and native choices for food, water to drink and habitats for shelter. Bumblebees may nest in tussocks of grass or moss on a bank of long grass at the edge of your plot. Planting catmint and clover should encourage them into your garden. White-tailed bumblebees now survive our milder winters so planting winter-flowering nectar rich plants will help them do even better. Solitary bees are not at all aggressive; bumblebees and honeybees are unlikely to sting unless disturbed, so enjoy watching them and leave them to forage in your garden. Replace some of your lawn with a meadow area or some British wildflowers. Clumps of bee-friendly plants, planted in sunny positions are more attractive to bees than scattered or shady spots. Honeybees like saucer-shaped flowers as they are easier to get into with their short tongues. Different species of bumblebees have different lengths of tongue, which means they feed from different shaped flowers. Large shrubs and trees are a vital food source as well. Five established winter-/early spring-flowering trees supply a similar amount of pollen and nectar as an acre of meadow.